We sat down to an autumn dinner in the spring! I love a delicious soup any time of the year and having a head of cauliflower and three large parsnips in the refrigerator for the past two weeks was all the influence needed to put this soup together. And of course for my friends living in the Southern Hemisphere, timing for this soup may be just right. While the parsnips were roasting in a hot oven with melted butter and a little brown sugar, the cauliflower was simmering on the stove in vegetable stock. Rather than roast the cauliflower I prefer to simmer the cauli-florets in broth with finely diced shallots. The pungent cruciferous flavor mellows in the broth and the shallots add lovely flavor. After the cauliflower is tender, roughly blend into a delicious soup and top with caramelized parsnips and chives. Preheat the oven to 350°F. In a large dutch oven heat the olive oil on medium heat. Add the shallots and cook until aromatic. Add the cauliflower and push it around the pot to coat with oil/shallots. Add the stock and turn up the heat to high. Bring to a boil and reduce heat to medium. Continue a slow boil until cauliflower is tender. In the meantime, melt the butter and stir in the brown sugar. Add the parsnips and butter/sugar mix into a bowl and toss to coat well. Place onto a roasting pan, cover with foil and roast in the oven for 2o minutes. Remove foil, stir and place back in the oven for 20 minutes until brown and caramelized. When cauliflower is tender and ready, whizz with a hand blender until desired consistency is met. Season with salt and pepper and serve with caramelized parsnips and snippets of fresh chives on top. Wow!! Such a tasty and delicious recipe!!! I love the pictures!!! :) Hi Serena! Thank you so much, that’s quite a compliment coming from you because I am so impressed by your gorgeous photography! 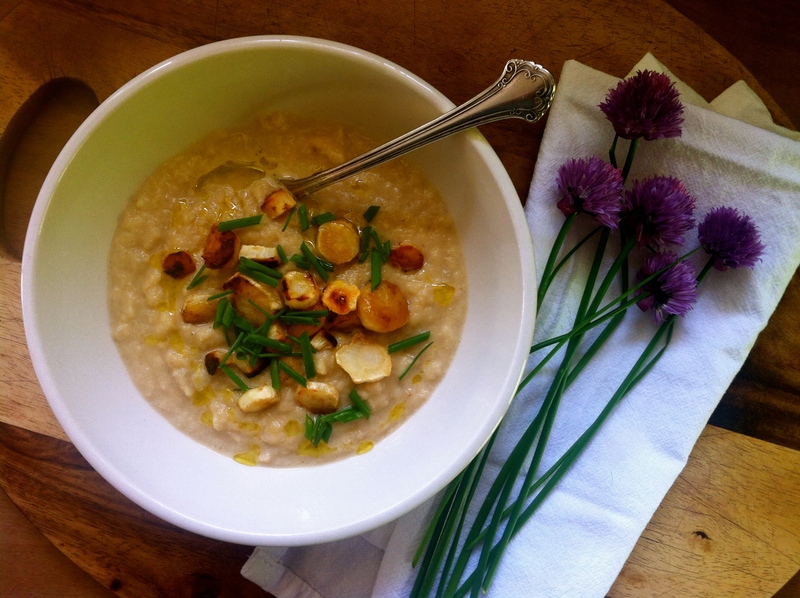 A great recipe to take cauliflower soup to a new flavorful level. Yes Jovina, it really was a nice (although a bit heavy) soup recipe. In the colder months I really don’t notice how filling parsnip can be. Heavy, but really tasty! Love how you treated all the components of this dish, I’ve never roasted turnips in that way with butter and brown sugar, I bet that was delicious with the cauliflower. Love how your roasted the oarsnips first. MMM good! Thanks Johanne! :) Mmmm good! This sounds wonderful and that bowl is amazing! Love the idea of adding chives…they are one of my favorite toppings. Haven’t used shallots in ages. Where I used to buy them stopped selling them. Really must start making more of an effort with my savoury food! And with soups. Okay, I’m making lettuce, black bean and potato soup tomorrow. But that’s only to use up the lettuce. Anyway, loving the way you’ve placed your sliced parsnips – bet that took a while. :) I can really get into doing stuff like that. Isn’t that gorgeous! Love cauliflower but have never tried it in soup form. I guess time to try it this way now. Very creative idea to serve it with oven roasted parsnips..
You made soup today too?! You and I seem to always be on the same wavelength! It’s hot today though…90°F, which is a scorcher here in Seattle. They even put out an excessive heat warning! :) My bamboo is loving it! We had a rainy day with temperatures in 70s. A good bowl of mushroom soup! Good use of ingredients. The parsnips add a lovely depth of flavor. Would you consider maybe honey instead of the brown sugar for getting the balance back in? What about o few drops of acid? I think honey would work for sure. Not sure about acid though…as in, say vinegar? May be wonderful! Your soup sounds lovely- and I absolutely LOVE your wood bowl and presentation. Seana, that soup is fantastic, I just love cauliflower and really love it in soup. LOVE the garnish, parsnips are so good and I think it’s a perfect match with the cauliflower. I wondered what to do with both of these “white” vegetables and I couldn’t think of any other way to match them other than soup. Rather than simmer the parsnips in with the cauli I imagined caramelizing them and it worked really well! Ok, now our temps are too high for a soup like this… Thank you Suzanne! My kind of soup – of course because I love parsnips…. We love soup & eat it year round; I make 1-2 pots of soup each week. I love the way you roasted the parsnips…they sound delicious! Can’t wait to try this soup! :) Thank you. Makes me happy you dropped in and left me a nice comment today! oh yum~ just returned from shopping and forgot to buy a cauli, otherwise I would be making this soup right now! Love that you’re posting recipes for our side of the world dear Seana! So very sweet of you. ;) I’m very much in the mood for soups these days, so will be making this sometime soon for sure. Love how there is a roasted element mixed with the cauliflower that has been simmered away with the broth. Oh and how beautiful are those little chive flowers – gorgeous colour! A soup post is excellent timing Seana – we’re freezing our proverbials off over here! Love the spray of purple blooms next to your soup. 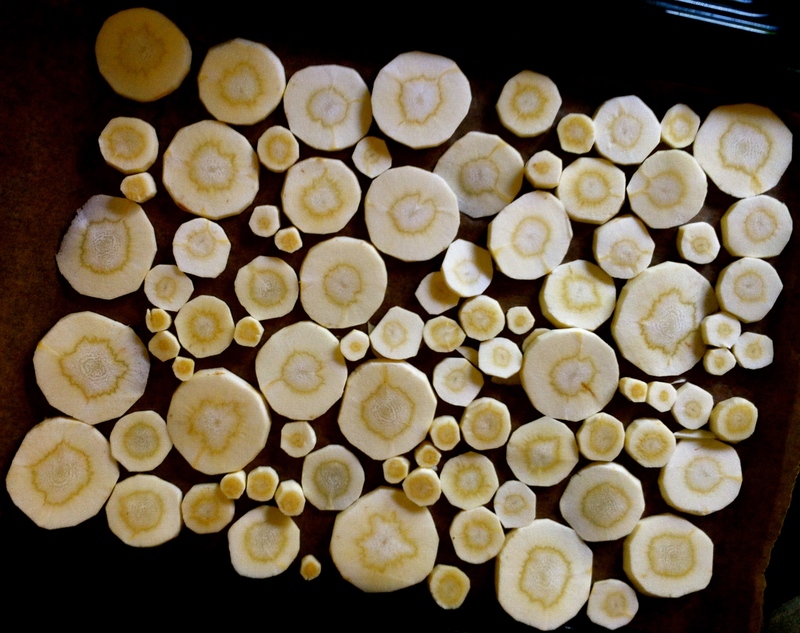 Parsnips with melted butter and brown sugar sound heavenly. Love a soup with lots of texture! Simply damn delicious n comforting soup!!! Great post and a fabulous soup!!! Such a great combination of flavours, especially that roasted parsnip. And love the charming photograph with the chives. We haven’t warmed up yet in Ontario Seana – it’s still soup weather here although I’m sure the heat will hit us soon. I’m thinking some leftover shredded chicken added in would be a yummy variation! This sounds lovely – I do love a creamy cauliflower soup and what a great way to use parsnips – I honestly never do anything except roast them. Thank you Little Vegan Bear. :) Love your blog name… now that you mention it I don’t think I have ever cooked parsnips any other way. Only roasting. They’re so unique! Love them. This soup would be a medicine during the cold weather. It’s true. Can you believe I made it in the spring? It was delicious and well, the temperature weren’t too warm so a nice hearty bowl of vegetable soup was perfect. Ah this will be perfect for the cauliflower i’ve got in the fridge! Perfect weather for a good soup here! I would enjoy a bowl of your soup no matter the season. Agree! I need to get back to it! This soup looks lovely. Would be great to warm us up on the cold days we have been having recently. 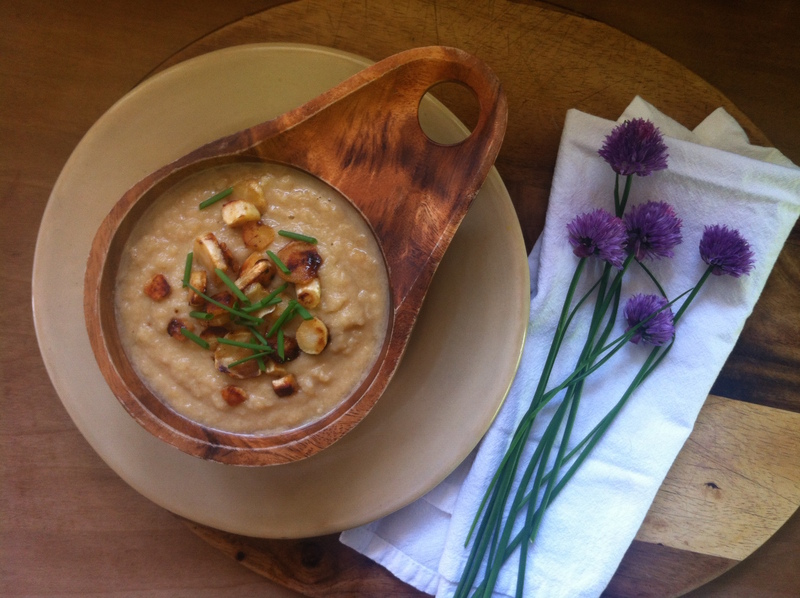 You are currently reading cauliflower soup with roasted parsnips & chives at COTTAGE GROVE HOUSE.